Featuring the World's Most Amazing Places to Work and the Ultimate Office Space Accessories. A staple in every office across the globe is the furniture. From the chairs, tables, and desks, everything most likely gets used on a regular basis. Picking out the proper furniture is a far more important task than anyone realizes. From the waiting room lobby, to the swivel chair your social media manager sits in for 8 hours a day, each piece of furniture makes an impression on someone whether it's through its comfort, style, or lack thereof. There are many factors that come into picking out office furniture and you have to be sure of your decisions before each thing you choose. The office chair is quite possibly the most important piece of office furniture your company has at its disposal. Sitting in the office chair all day can lead to a grumpy employee, and employee injuries later in life, especially severe back pain. Comfortable chairs are not only a luxury to the office, but key to maximizing productivity as the workers are sitting for more than eight hours a day, leading to back aches, stiff necks, and irritability. Before you buy office chairs for the company, do some research and find the most ergonomically friendly ones out there. Happy employees will lead to a happy company, which will make you a happy employer or co-worker. One of the hottest topics of debate over the past few years on the subject of office furniture has been the standing desk vs. the sitting desk. While the sitting desk has been a staple of the American workplace since what seems to be the dawn of time, the standing desk has been making a surge in the office as of late as employers and employees are beginning to realize the benefits of having them available. There are many pros and cons to both desk which can both serve a great purpose in the office. The sitting desk does allow the worker to be able to rest a little bit more and potentially puts them in a more comfortable position. While the negative affects can be back and neck pain over long periods of time. The standing desk on the other hand, will usually provide employees with more energy throughout the day, which will lead to heightened focus and inspiration. On the con side, it is much easier to develop leg pain from standing for several hours on end. 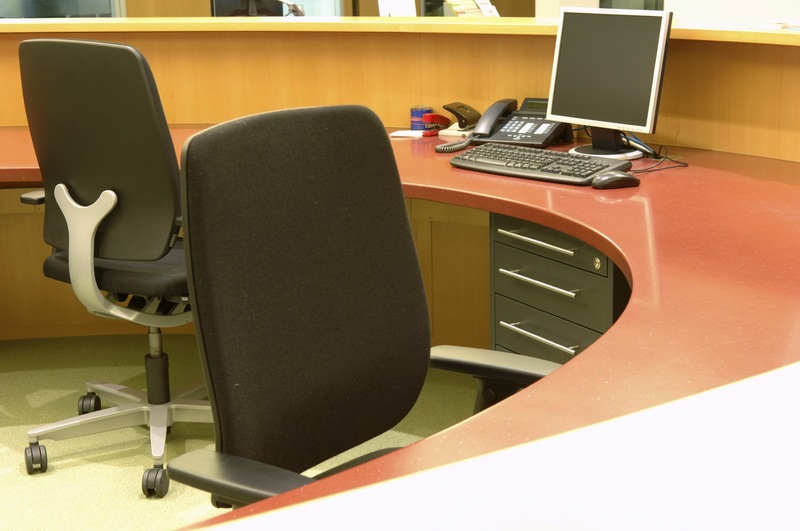 There are many factors that go into buying the proper furniture for you and your team. Make sure you go with the right selection by hiring a professional consultant to give you tips on what desks and chairs are best for you team for their short term and long term productivity and happiness. Office Chair Function Chart - What Does Each Lever Do?